(Nanowerk News) By using common materials found pretty much anywhere there is dirt, a team of Michigan State University researchers have developed a new thermoelectric material. This is important, they said, because the vast majority of heat that is generated from, for example, a car engine, is lost through the tail pipe. It’s the thermoelectric material’s job to take that heat and turn it into something useful, like electricity. The researchers, led by Donald Morelli, a professor of chemical engineering and materials science, developed the material based on natural minerals known as tetrahedrites. “What we’ve managed to do is synthesize some compounds that have the same composition as natural minerals,” said Morelli, who also directs MSU’s Center for Revolutionary Materials for Solid State Energy Conversion. “The mineral family that they mimic is one of the most abundant minerals of this type on Earth – tetrahedrites. The search to develop new thermoelectric materials has been ongoing. Morelli said that while some new, more efficient materials have been discovered as of late, many of those are not suitable for large-scale applications because they are derived from rare or sometimes toxic elements, or the synthesis procedures are complex and costly. The MSU researchers’ method involves the use of very common materials, grinding them to a powder, then using pressure and heat to compress into useable sizes. “It saves tremendously in terms of processing costs,” he said. The researchers expect this discovery could pave the way to many new, low-cost thermoelectric generation opportunities with applications that include waste heat recovery from industrial power plants, conversion of vehicle exhaust gas heat into electricity, and generation of electricity in home-heating furnaces. The research was published in the online journal Advanced Energy Materials. 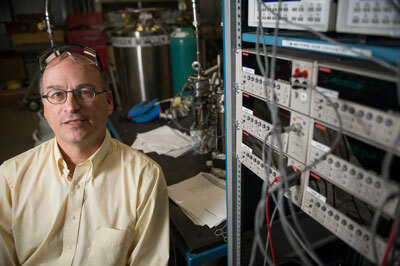 The work is supported by a grant from the U.S. Department of Energy/Office of Science. The work is a partnership with the University of Michigan and UCLA. Other institutions involved with the MSU-based center are Northwestern University, the Ohio State University, Wayne State University and Oak Ridge National Laboratory.